Audio Spray Gun is an experimental tool for fixed-media composition that simultaneously generates and spatialises large groups of sound-events from a single sound source. This is achieved by randomly creating points constrained by a locus or ‘particle zone’ within a multi-dimensional parameter space. When this locus is transformed over time, the program produces a sequence of events, which can then be rendered to multichannel audio. 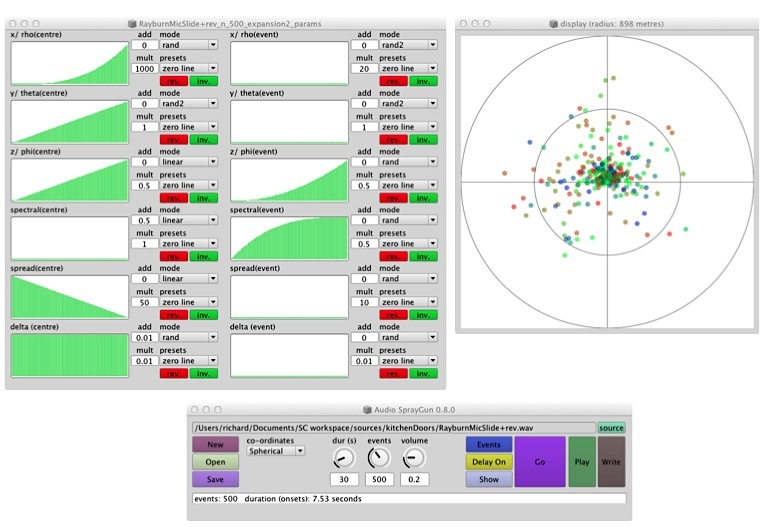 While earlier versions of the program were designed to render audio direct to eight-channel surround, version 0.8 has been extended to include three-dimensional spatialisation and the option to store sound-groups as metadata for later modification. For more information on the theory behind this, see Audio Spray Gun 0.8 – the Generation of Large Sound-Groups and Their Use in Three-Dimensional Spatialisation ICMC 2015, Denton, Texas. Audio Spray Gun runs in SuperCollider 3.6.3 (SC) and has been tested on an Apple MacBook Pro running OSX 10.7.5. It has not been tested on PC or Linux systems. At present, ASG will not record multichannel interleaved audio files to disc on later versions of SC. This is due to a SC issue that is expected to be resolved in version 3.7.